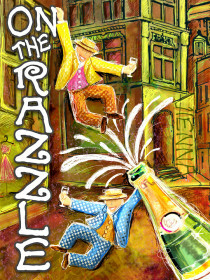 On The Razzle by Tom Stoppard. Stoppard's farce consists of two hours of slapstick shenanigans, mistaken identities, misdirected orders, malapropisms, double entendres, and romantic complications. Herr Zangler, the twisted-tongued proprietor of an upscale grocery store in a small Austrian village, plans to marry Mme. Knorr, the proprietor of a women's clothing shop in Vienna. In preparation for new life in the big city, he orders a new wardrobe and hires the fast-talking Melchior as a personal assistant. He arranges to send his niece Marie to his sister-in-law in Vienna, Miss Blumenblatt, to protect her from the penniless Sonders who is courting her. As he departs for Vienna, Zangler entrusts the operation of his business to his garrulous head clerk, Weinberl, and his naive apprentice, Christopher, who decide to go "on the razzle" to Vienna. Almost immediately, Weinberl and Christopher catch sight of Zangler and disguise themselves as mannequins in the window of Mme. Knorr's House of Fashion. Circumstances propel the two into a fancy restaurant in the company of Mme. Knorr and her customer, Frau Fischer (who has been roped into pretending she is Weinberl's new wife), the same restaurant to which Zangler intends to take Mme. Knorr. Several sprinting waiters, a sexually obsessed coachman and a carefully positioned Chinese screen come into play, and things finally seem to be settling down when the eloping Sonders and Marie enter the scene and the chaos starts anew. The various characters flee to Miss Blumenblatt's, who mistakes Weinberl and the disguised Christopher as Sonders and Marie. Eventually, all is sorted out, Christopher and Weinberl make it back to the store in time to prevent Zangler from ever knowing they were gone, and everything solves itself: Sonders comes into an inheritance and is allowed to marry Marie, Weinberl and Frau Fischer discover they have been romantic pen pals all along, Christopher is promoted, Zangler and Mme. Knorr finalize their engagement, and life returns to normal after one night "on the razzle."